Last week, I was at the grocery store when my mother started speaking with a lady behind us in line, just like a couple of old friends. Then, all of a sudden, the woman yelled my name and came over to give me a hug! Who was this mystery lady who’d all of a sudden become such a dear family friend? I had no idea! I wanted answers! As she got closer, I recognized her face but still couldn’t put a finger on it. There was something different. Then all of a sudden, it hit me: it was my mother’s best friend Michelle from out of town! I didn’t recognize her because she’d let the dark dye and highlights grow out of her hair and replaced it with her natural grey. It looked great, but I wondered why, after all these years, she would decide to make the change. She explained to me that her friend was diagnosed with cancer in 2011. Her friend believed that the hair dye she’d been using for years was a contributor. Although the friend lost her hair while undergoing chemotherapy, Michelle decided she would support her friend—and potentially limit her cancer risk—by electing to keep the toxins from hair dye out of her body. This was interesting to hear because a few months ago, I read about a study from England warning people about the dangerous, cancer-causing toxins associated with hair dye. This is actually a pretty big issue considering that roughly one-third of women over the age of 18 and 10% of men over 40 choose to freshen their follicles with hair dyes. So can hair dyes really cause cancer? The research out of Leeds suggests that chemicals found in hair dyes, called secondary amines, can cause cancer when combined with external pollutants in the atmosphere. The scientists explained that due to the chemistry of these chemicals, when exposed to tobacco smoke and exhaust fumes—pollutants that are often found in the air you breathe—they can form compounds called N-nitrosamines that are highly poisonous and carcinogenic (cancer-causing). The connection between toxins in hair dyes and cancer is not quite clear. Prior to the 1980s, hair dye was linked to cancer-causing agents, but those toxins have since been removed. So, unless you stockpiled your favorite hair dye in 1979 and are still using it, research indicates you have little to worry about. This doesn’t mean hair dye is completely in the clear, though. In reality, the jury is still out. There have been numerous studies done and conflicting results have arisen. For example, there has been research showing that hairdressers and barbers are at an increased risk of developing bladder cancer. 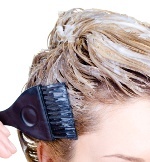 There have also been studies showing that personal use of hair dyes is linked to carcinogens. In these cases, both studies were done by the International Agency for Research on Cancer. If you don’t like the idea of the toxins in hair dye or don’t want to worry about whether or not they are carcinogenic and can potentially cause cancer, you have a couple of options. If you’re not ready to go grey like Michelle, try henna. You may have heard of henna before, as it’s often used for temporary body art—it can also be used as a natural hair dye.